Awesome Friday! 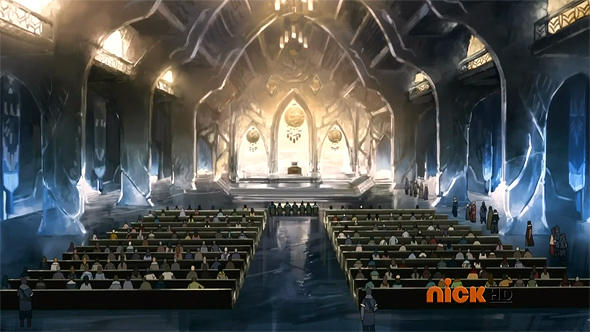 » Blog Archive The Legend of Korra: Episode 2.04 Recap, Thoughts & Speculation - Awesome Friday! It’s that time of the week again! Episode 4 of The Legend of Korra Book Two aired today, so I’ll be providing a quick recap, thoughts and speculation after the jump! Have thoughts of your own? Feel free to leave them in the comments section at the end of the article. Civil Wars, Part 1 ended with Chief Unalaq bursting in to arrest Korra’s parents, Tonraq and Senna, on suspicion of conspiracy to assassinate their Chief. 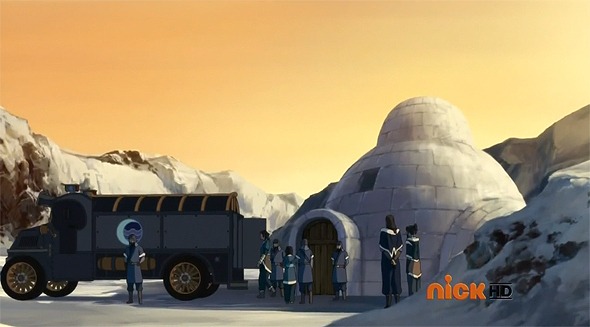 As Part 2 opens, Tonraq and Senna are being ushered into the back of a police truck in a scene reminiscent of Mako, Bolin and Asami’s arrest at the hands of Tarrlok in Book One. It seems Korra has learned her lesson from last time (when she confronted Tarrlok in his office and ultimately ended up in grave danger), as instead of reacting with violence, she calmly pleads with Unalaq to reconsider. He says he’ll have a wise and fair judge appointed. And so, the suspects (minus Varrick, who successfully hid from the royal family inside a stuffed platypus bear) go to trial, but the judge is anything but fair. After a quick trial with very little defense, he lets Senna go free, but then sentences all the other suspects to death. Unalaq intervenes on behalf of the suspects, and so the judge agrees to send the suspects to prison instead. Bolin, meanwhile, is still trying to escape his unpleasant relationship with Eska. He tries to break up with her, but she clamps an engagement necklace around his throat and demands he marry her the next day. Korra visits her father in jail, intending to break her out, but he tells her to leave him. If she accidentally starts a war, the South would surely lose to the powerful North. Korra respects his wishes, but isn’t content to leave it at that. She chases down the judge, using Naga to threaten him into telling her everything. He confesses that Unalaq set up the whole trial, and, worse yet, set up Tonraq to be banished from the North when they were young. Furious, Korra finds Varrick and her friends, looking for help to bust the rebels out of jail. When they arrive at the jail, however, Unalaq is one step ahead of them: the rebels are already on a ship headed for the North. He reminds her that as the Avatar, she cannot threaten war, but she replies that she’s done being manipulated by him. 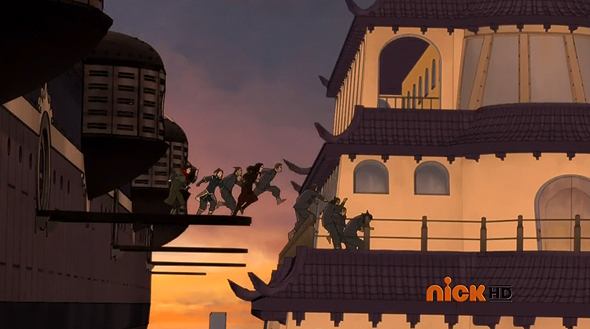 After a brief battle, Korra and her friends escape. With the help of Varrick’s ship, a plane, and some creative bending, they’re able to catch up to the ship and free Tonraq and the rebels. While she wants to stay and help the South, Tonraq asks her to seek the help of the United Republic instead. As they’re leaving, however, Varrick points out that they’re being pursued by a furious waterbending Eska. Tenzin, meanwhile, finds Ikki unharmed in a cave filled with baby sky bison. She has given each of them cutesy names, saying they’re her new family now. Tenzin, disenchanted with his own siblings, joins her for awhile, but when the sky bison return to their parents, Tenzin and Ikki decide it’s time to return to their family as well. There’s a small reunion, some apologies exchanged, and some touching moments of sibling bonding. They may have their differences, but they’re all one big happy family deep down. The animation this season continues to be hit-and-miss. This episode definitely has a bad case of talking heads, especially the opening conversation between Korra and Unalaq, a side-on shot with flapping mouths that lasts almost 20 full seconds. There are also some odd facial expressions here and there, with eyes askew and mouths at odd angles. That being said, some of the sequences are gorgeous. The backdrops are consistently stunning, and the lighting effects are always beautiful. I enjoyed the whole plane sequence, and some of the key facial expressions were worth two thumbs up. There was lots of family love to go around this episode, especially in Tenzin’s family. I’m not sure yet if this is to contrast Tonraq/Unalaq’s relationship, or to foreshadow that they’ll reconcile in the end. (Perhaps both?) Either way, I’m enjoying it. In particular, I love the dynamic between Korra and her parents. This episode had a short scene where Korra was comforting a weeping Senna, and I may or may not have teared up a bit myself. I also love Korra’s use of the Avatar State this season: she can easily turn it on and off, fully in control the whole time. It makes sense, given that she has always embraced being the Avatar, and given her love of power and strength. Aang, by contrast, didn’t want to be the Avatar, and he was afraid of his own power, so for him, at least initially, the Avatar State was something he only used when he lost control. This is a subtle distinction between the two Avatars that does a great deal to accentuate their differences. I don’t think we’re at the bottom of this Unalaq thing yet; I’m not convinced that everything about the villain has been revealed only 4 episodes into a 14 episode arc. I’m guessing the spirits have more involvement in his actions than we currently know — either he’s being controlled/influenced, or there’s a deeper issue with the spirits that has yet to be revealed. I did find it interesting that he told Korra exactly where to find her father, making it easy for her to rescue him. Could it be he wants to start a war? Some connection to the dark spirits he keeps mentioning, perhaps? Aside from that, I’d love to see Eska, maybe along with Desna, team up with Korra et al, particularly if their father is being controlled/influenced. 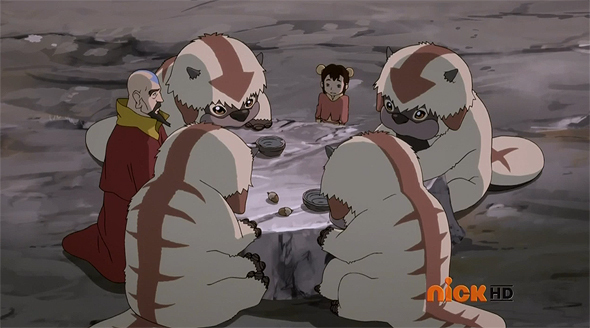 I’m a sucker for characters becoming friends, and it would fit nicely with the family bonding theme we’re seeing in Tenzin’s side plot. This may not be possible, however, given some of the promo shots for upcoming episodes that suggest the twins may be fighting Korra. Speaking of Eska, I’d like to take a minute to address the Bolin and Eska relationship. So far, I’ll admit, the abusive nature of it has made me uncomfortable. However, I loved the end shot of her chasing after him, because she looked genuinely upset, which made me feel she cares for Bolin more than she’s letting on. Perhaps the start of character growth? Sometimes abusive behaviour stems from ignorance instead of malevolence, and if she genuinely cares, she may be willing to learn/fix her ignorance. I’d really love to see a bit of a “redemption arc” for her where she makes a genuine attempt to be a good partner. Again, this may not be possible, given those promo shots. And it’s always possible she’s just malevolent. Other than that, I don’t have a whole lot of speculation at this point. Everything seems suspiciously straight forward right now, which, given the way Book One played out, makes me think we’re on the cusp of some plot twists. Hold on to your seats, folks: the next few episodes might be a bumpy ride. *I’m finding the Tenzin Family Vacation Arc curiously more entertaining than the main plot, though I hope they both continue to get better. As a sucker for father/son moments, the scene between Bumi and Aang’s statue was deeply touching. *Sadly, I kind of enjoyed Bolin and Eska’s relationship at first, but it’s gotten to an uncomfortable level. Neither of them seem to be experienced in relationship’s (Bolin’s inability to approach their issues, and Eska’s possessiveness/verbal abuse), so I kind of hope the rest of the season will show them learning to handle one another in healthier ways. Because I would like them to be together for at least a little longer, they seem like they’d be cute together in a healthy setting. –Though the family dynamic would be weird, Mako with Korra, and Bolin (Mako’s Brother with Eska (Korra’s Cousin) making them what kind of in-law’s? *Korra’s threat in the courtroom seemed extreme even for the situation. Not only did she make a verbal claim on his life in front of dozens of people, but their very next scene together was her chasing him down and physically threatening him with Naga (Warm tongue on the back of his head and everything.) The judge certainly had a henchman vibe to him, but level of animosity for this side-character felt out-of-place. The Bumi & Aang moment was fantastic, and I don’t think I adequately expressed my love for it in this post. I do hope we see more family bonding moments like this. I’m secretly hoping the Tenzin plot & the Korra plot are going to come together in a meaningful way. I agree, I hope Bolin/Eska can turn into a healthy thing. It could be a good arc about learning how to have a healthy relationship. 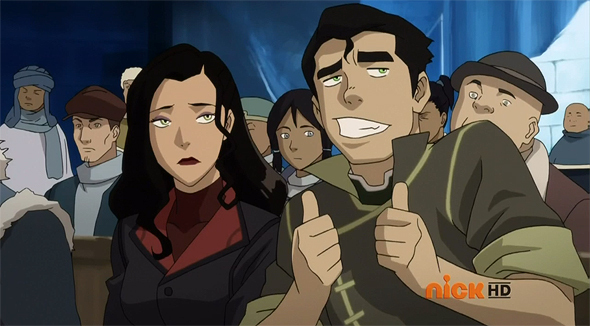 Am I the only one that just thinks the Eska/Bolin thing is a tad sexist? I know that sounds weird coming from a guy but just imagine if Bolin was a woman and Eska was a man. It wouldn’t fly at all. Yeah it’s a well worn trope but I’m just tired of it. The laughs it generates, when it actually generates them, are cheap and the characters come off one dimensional. Hi Matt! Completely agreed about the Bolin/Eska thing. It’s abusive, and you’re absolutely right, more people would be up in arms if the genders were swapped. I’m pretty happy to see various folks among the fandom standing up to say that it’s abusive as it is, because abuse is abuse regardless of the genders of the people involved. It’s a trope that we, as a society, really need to move past. I’m hoping they’re leading somewhere with it, but can’t say I’m enjoying it so far.